1: To reinforce a point Charles Pierce made today: DACA folks are Americans. Full stop. They may not be citizens, but they are us; members of our society, our community. They are not strangers. Any attempt to frame them as aliens, or criminals — or as developmentally delayed moral agents who need (as John’s former elementary school teacher put it) being taught right from wrong — is both wrong and vile. Task two, of course, is to teach every national Republican, no matter what goodness may reside in their hearts, bless their hearts, the lessons California GOPsters learned post Prop. 187. To me that means that the first priority for any political action centers on voting. I’m going to call my local town Democratic committee first, and see what I can do there to register folks. Given that my town votes 2-1 D every election, with good turnout, I’m hoping they’re making the same connections they do every election with Ds who need help in New Hampshire. If I get no joy there, I’ll contact folks directly in neighboring states. After registration, it’s voter education and then turnout. That’s it. The unintended consequence of Trump’s reign of misrule is that a lot more people have become aware that politics does in fact matter where each of us live. It’s incumbent on all of us to make sure that realization doesn’t go to waste. Last: again, this isn’t an issue in my home town of Brookline, MA — but this is why we need Democrats running in every office, down to assistant dog catcher. Neighbors seeking votes mobilize voters as no one else can; if we have people doing so for every office, that’s a big part of the battle right there. So I’ll be doing what I can to tell those up the food chain in the party that we gotta do what the Republicans, to their tactical credit, have long understood to be vital. That’s it. My motto going forward: Get (Stay) Mad. Get (More Than) Even. 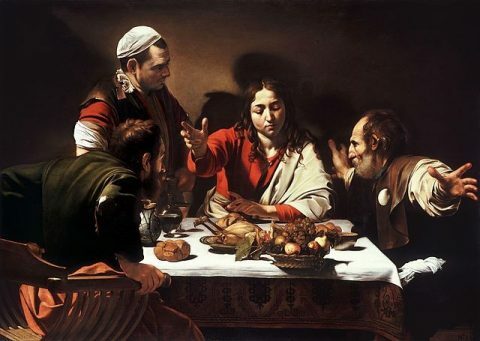 Caravaggio, Supper at Emmaus, 1601. Explore posts in the same categories: Moral Trumpitude, Republican knavery, Stupidity, Things that actually matter, Two Parties -- Not the Same, Uncategorized, Who thought that was a good idea?, Why Do They Hate America So? This entry was posted on September 5, 2017 at 3:17 pm and is filed under Moral Trumpitude, Republican knavery, Stupidity, Things that actually matter, Two Parties -- Not the Same, Uncategorized, Who thought that was a good idea?, Why Do They Hate America So?. You can subscribe via RSS 2.0 feed to this post's comments.